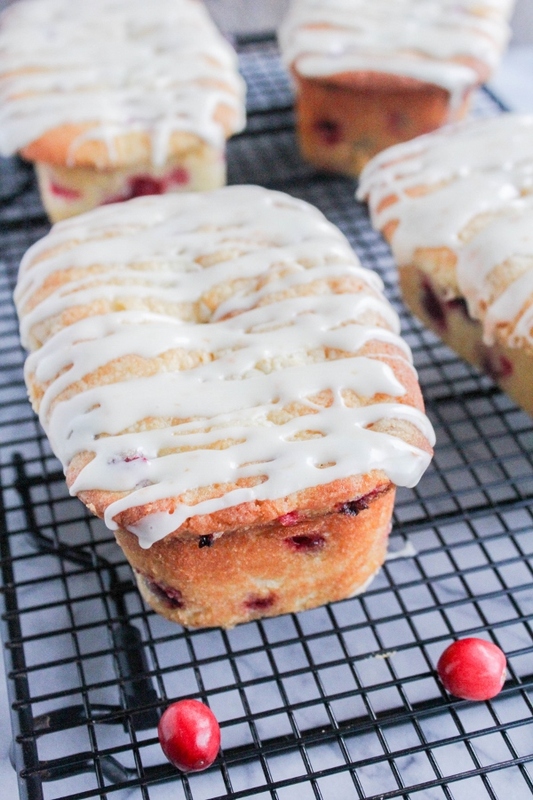 These Mini Orange Glazed Cranberry Loaves are tender and moist and bursting with flavor. It's the perfect recipe to share with friends and family this holiday season! I just love the holiday season. I love everything about it, from the decorating to the twinkling lights to the baking to the time spent with family and friends. It truly is a magical time of year. One of my most favorite things is the joy of giving. At this point in my life I enjoy giving much more than receiving. I think that happens to us all as we grow older, especially if we have children. There isn't anything quite as special as watching your kids open gifts and seeing their faces light up! But giving doesn't always mean buying gifts. 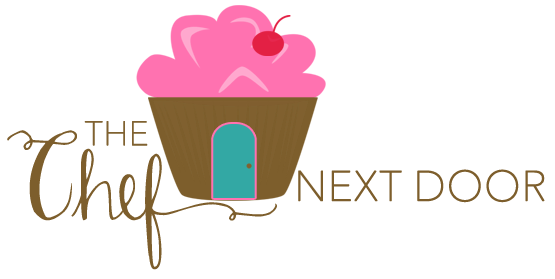 You can give homemade gifts, edible treats, and give the gift of your time to help others. This holiday season I've been baking up a storm and packaging up lots of treats for friends, family and neighbors. 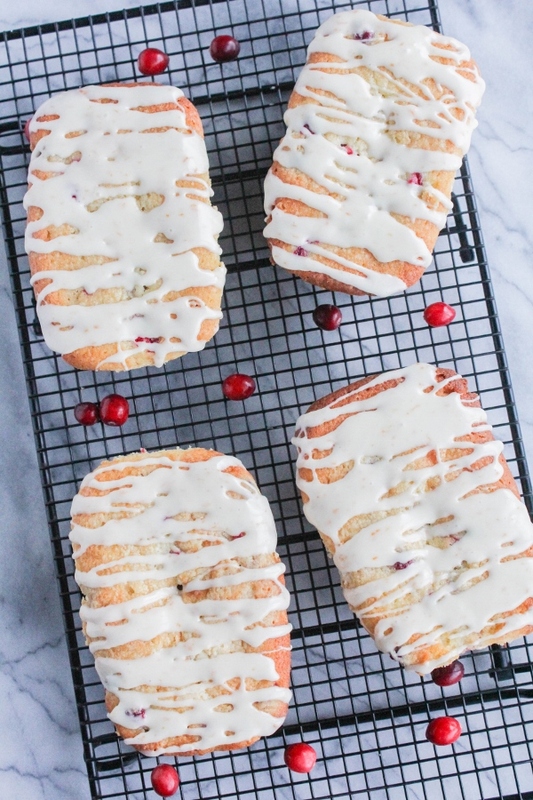 Everything from cookies and candies to these Mini Orange Glazed Cranberry Loaves, there has been a lot going on in my kitchen! 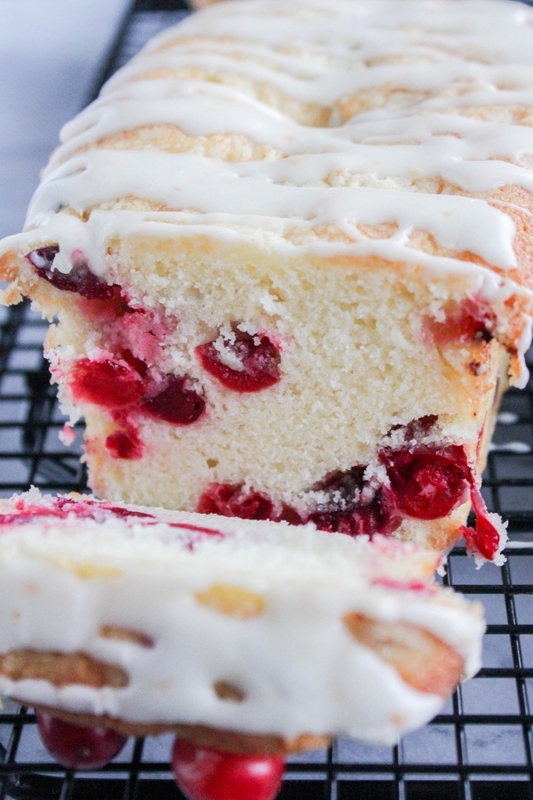 These beautiful cranberry studded loaves make perfect gifts. You can bake them in individual mini loaf pans, wrap them in cellophane and tie with a bow, or, just place each loaf in a holiday treat bag. However you gift it, everyone will love it! Since I love to bake, I'm doing something special for those less fortunate this holiday season by performing random acts of kindness. My parents live in a retirement community and there are many residents there who are alone and don't have family near. I'm baking some of my favorite holiday treats and giving them, along with a special holiday card, to some of the residents in the community. I will be hand delivering them and hopefully stopping in for a quick chat. It's something small, but something that will brighten the day of someone who doesn't get many visitors. I invite you to join me to perform your own random acts of kindness! One simple thing you can do is to join the Holiday Meal Drive with Produce for Kids. Click on the link, like their page or share the post on Facebook. 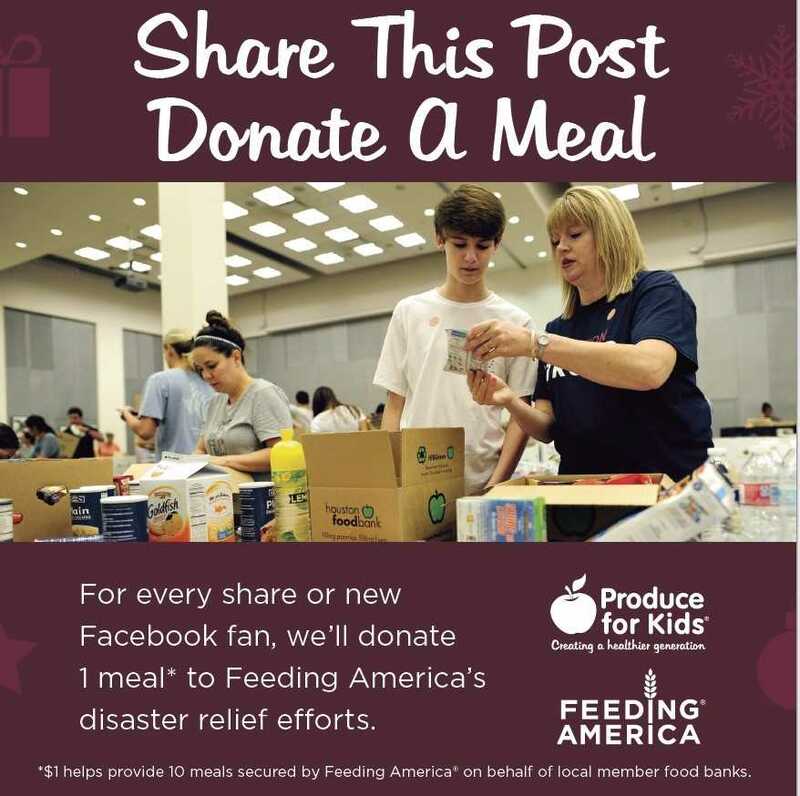 Every share of the post or new Facebook fan equals one meal donated to help Feeding America disaster relief efforts. Produce for Kids’ first Holiday Meal Drive took place during the 2016 holiday season and helped to secure 15,223 meals for families in need through Feeding America. I don't know about you but I'd love to help them surpass that goal this year! Meals raised through the Holiday Meal Drive will go to areas affected by recent hurricanes, including Texas, Florida and Puerto Rico, as well as the recent wildfires in California. Through in-store and online programs over the last 15 years, Produce for Kids has donated more than $6 million to charities like Feeding America that benefit families and children. Preheat the oven to 350 degrees. Spray a four-loaf mini loaf pan with non-stick baking spray. In the bowl of a stand mixer, cream the butter and sugar together until light and fluffy. Add the eggs one at a time, beating well after each addition. Add the orange and vanilla extracts and mix until combined. In a large bowl, whisk together the flour, baking powder and salt. Add the dry ingredients alternatively with the milk to the wet ingredients until combined. Gently fold in the cranberries. Pour the batter into the prepared baking pan and bake the loaves for 40-45 minutes, until they are golden brown. Let the loaves cool in the pan for 20 minutes, then remove them from the pan and continue to cool completely on a wire rack. 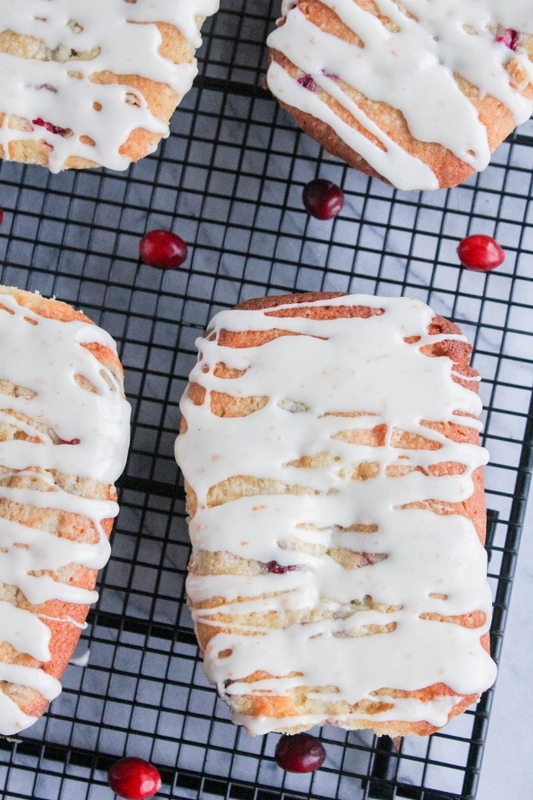 Whisk the glaze ingredients together until smooth and then drizzle over the top of the loaves. 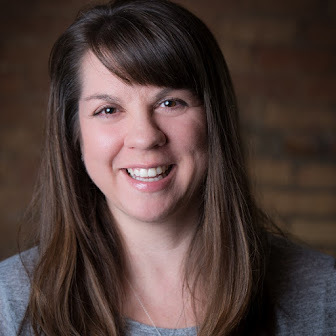 I'm proud to be a Produce for Kids partner and contributor and I thank them for sponsoring this post!